Indianapolis, Ind. – This was more than a race; it was a celebration of the past, firsts, and the future. This was Stefan Wilson’s first attempt at chasing immortality and the first of many. Wilson’s rookie appearance at the Greatest Spectacle in Racing was the scene of his first Verizon IndyCar Series race since the Grand Prix of Baltimore in 2013, the same year his team, KV Racing Technology, won the 97th Running of the Indianapolis 500. The pursuit began with rookie orientation in the No. 25 Driven2SaveLives-KVRT Chevrolet and progressed through a week of practice before attempting to qualify for the 100th Running of the Indianapolis 500. The 26 year-old Indianapolis resident qualified on the outside of Row 10, with a four-lap average of 224.602 mph. 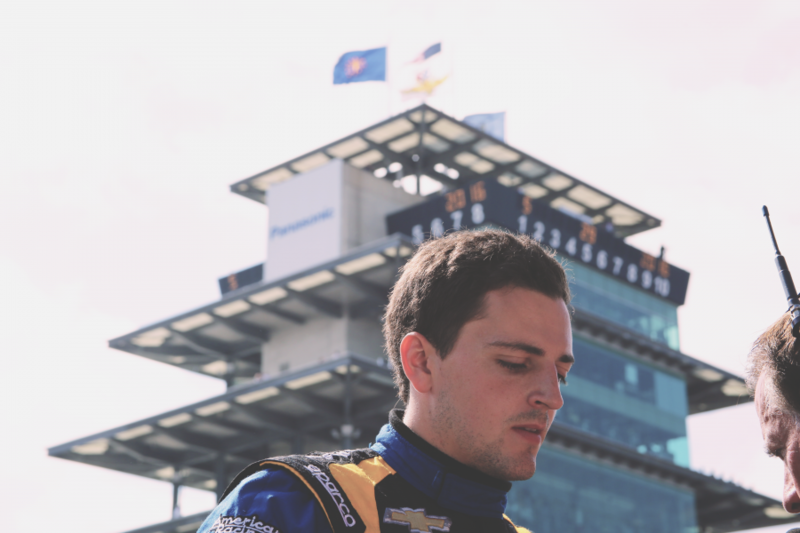 From the 30th position, Wilson’s goals as a rookie were to learn from racing in the pack and managing the pressure of the Indianapolis Motor Speedway’s first sold out crowd in the history of the event. With over 350,000 strong and millions of viewers watching around the world, Wilson stepped up to the challenge from the drop of the green-flag. In the first corner, Wilson held onto the outside line and overtook six cars going into turn 2. From there, the series rookie managed to set a consistent pace and settle in traffic in 23rd place with veteran and skilled competitors alike. The first pit stop came on lap 28, receiving minor aerodynamic adjustments, new tires and a full load of ethanol fuel. Despite a brief delay in pit lane, the Briton remained on the lead lap and started making his way through the field again; setting lap times faster than full-time Verizon IndyCar Series drivers and Indianapolis 500 veterans. After three more pit stops and successfully making his way towards a solid top 20 run, Wilson suffered a fuel leak, which caught the internal electronics on fire, forcing the Driven2SaveLives team to their pit box on lap 112. After falling behind the lead lap and recognizing further issues, the crew towed the car back to Gasoline Alley to further diagnose and resolve the mechanical issues. On lap 165, Wilson and the team re-emerged from the garage area and attempted to collect as much experience at 2.5-mile oval and to make up enough completed laps to gain valuable positions in the 33 car field. After running another handful of laps, the issue reemerged and the Indianapolis-resident had to retire from the race. Wilson’s early exit resulted in a 28th place finish, but the final result does not properly summarize the rookies’ month of May impact on and off track. The Driven2SaveLives program was able to generate astonishing levels of support and awareness for organ and tissue donation, and will play an important role in the future of motorsports. Next PostThanks To Everyone For Their Efforts.